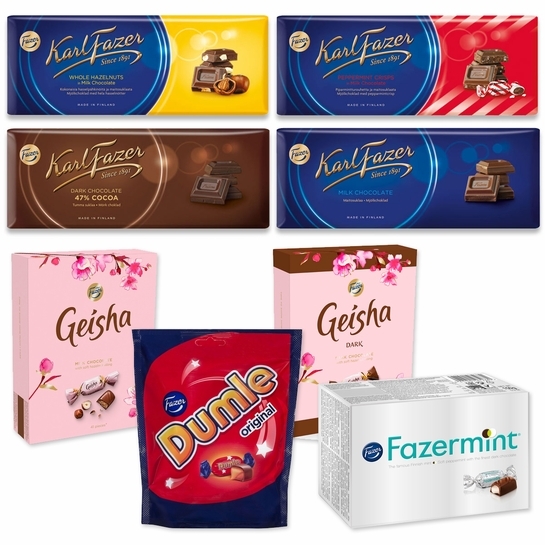 More about Fazer Candy Variety Gift Pack Can't make up your mind? Our holiday variety gift pack is an all-inclusive gift solution with a variety of Fazer brand chocolate bars and candies. The flavorful variety is sure to satisfy everyone's taste buds. This set includes a variety of decadent chocolate bars, as well as assorted candy boxes and bags. The Fazer gift pack contains over three pounds of delicious premium Finnish candy! Pretty good deal when you purchase all the items together. Good selection as well. Everyone will be happy. I ordered the variety pack; milk chocolates for my son in law and the dark chocolates for me. It arrived on time and packaging was good. I grew up in Finland eating Fazer candy and now it is nice to buy it without traveling to Finland. Nice sampler of Finnish sweets! The package arrived quickly and in good condition. This is a nice sampler of delicious Finnish sweets! 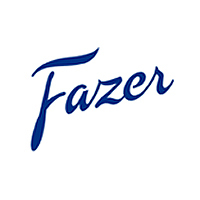 I love Fazer candy and continue to purchase them for presents as well. This is an excellent combo to try if you haven't tried Fazer chocolates yet. Got this as a birthday gift for my Husband, who's Finnish. I've never tried Finnish chocolate, but I am so getting more! It's not as sweet as American style and has a lovely decadent flavor that just melts in your mouth! I don't think my husbands been so surprised, or so happy with a gift! ProsLovely taste Great quality item(s) Sinfully indulgent Fast shipping Great price for gift sets! Delivered on time and correctly. Fazer chocolate is the best. From the variety pack you get something that everybody likes. In the end we all fight over the milk chocolate :) I highly recommend the Finnish candy. The candy arrived quickly, but the wrappers in the Geisha and Fazermint boxes were brittle and had broken into tiny shreds. Some of the candy had been unwrapped by the disintegration of the wrappers. Be careful when opening the box - you might have metallic confetti all over the place. The chocolate bars are tucked away for future slow consumption. Slow, methodical consumption. Merchant Response:Wrappers can become brittle during shipment in freezing temperatures. We will replace candy when this occurs. Contact us with any questions. ProsThe price for the package was fantastic. I have wanted to order some Fazer Sininen online, but other places wanted prices as high as $15/bar plus shipping. This gave me enough candy for a presentation today on Finland, and also allows me to enjoy some of the best chocolate in the world at my leisure. ConsShredded wrappers in 3 of the boxes made for messy picking and choosing of the items I would use for my class. Luckily there were enough with complete wrappers to use. My parents were so happy to receive this as part of their Christmas gifts. My mother loves Wiener Nugat and I'm sure it's now hidden away to be doled out throughout the year. "Blue bars" are like gold in our family, so my parents are now very wealthy!